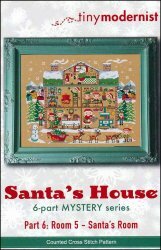 Santa's House Part 6: Room 5 - Santa's Room [D6736] - $2.00 : Yarn Tree, Your wholesale source for cross stitch supplies. Cross stitch pattern from Tiny Modernist. With his bright red suit, shiny black boots & long white beard...can you guess who it is?!?! It's Santa! Santa is getting to deliver all of the toys to the good little boys & girls. Everyone downstairs is getting ready for Christmas, as Santa finishes up getting ready. An elf is hanging the mistletoe above the big red chair, as a kitten takes a nap. The warm cookies have been pulled out of the oven. The dining room table is set for dinner. Outside the snow is falling & Santa's reindeer are eating their dinner. "Santa's House" is complete! Stitch count is 140h x 179w.